PHILADELPHIA (WPVI) -- Philadelphia Phillies fans will forever be in the heart of longtime catcher Carlos Ruiz and he wants them to know it. According to his agent Marc Kligman, Ruiz wanted to express how he felt about the fans so he went for the billboard route. "Says it all," Kligman tweeted. "I loved playing for you. You will always be in my heart. Thank you, Philly! 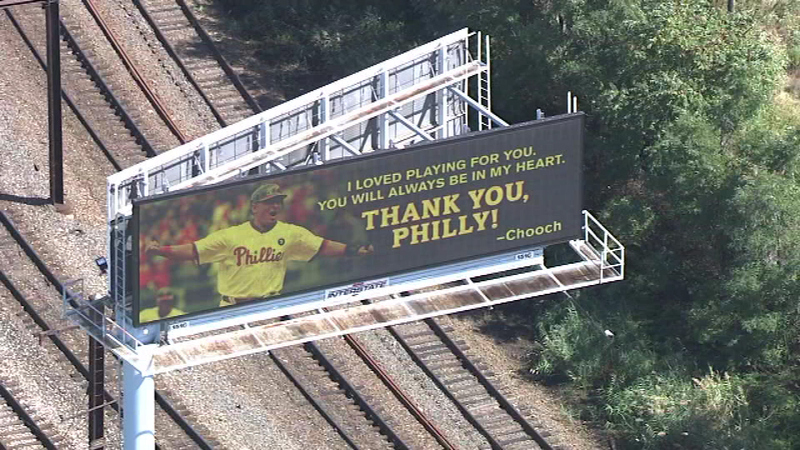 - Chooch"
Kligman says a second billboard with Ruiz's message can be seen on westbound I-276 near Exit 343. He tweeted, "So happy fans like the billboards! Carlos chose the pic, he and I penned the message and Interstate Outdoor Advertising awesome w/design and locations." Last month, Ruiz was traded to the Los Angeles Dodgers. Action News caught up with Ruiz at the Philadelphia International Airport as he was leaving. 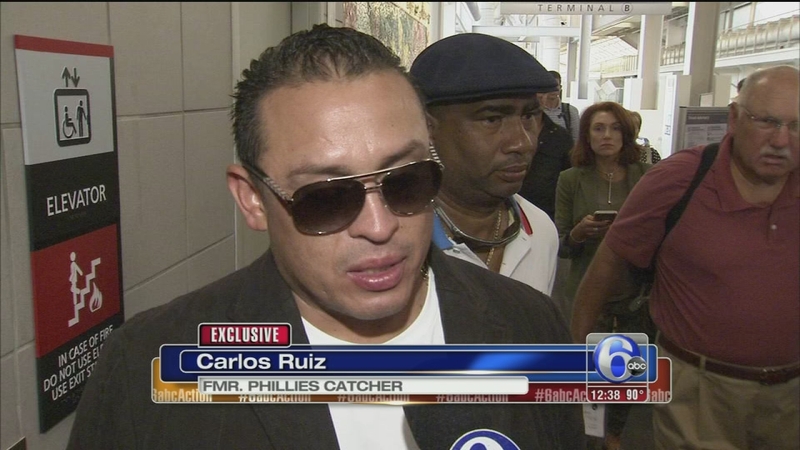 Action News was at the Philadelphia International Airport on Friday morning to catch up with Carlos Ruiz. "It was real sad. Today when I left from my house, it was tough. All day yesterday was the same way. I had a lot of phone calls from family and friends," Ruiz told Action News. Ruiz spent his entire 11-year career with the Phillies, winning a World Championship in 2008. As he left for his plane, he said Phillies fans are the "best fans in the world." Phillies fans were not the only ones to get a goodbye message from Ruiz. Before leaving the clubhouse one final time, he left a note to his former Phillies teammates saying, "I will miss all of you guys. Good luck the rest of the season. 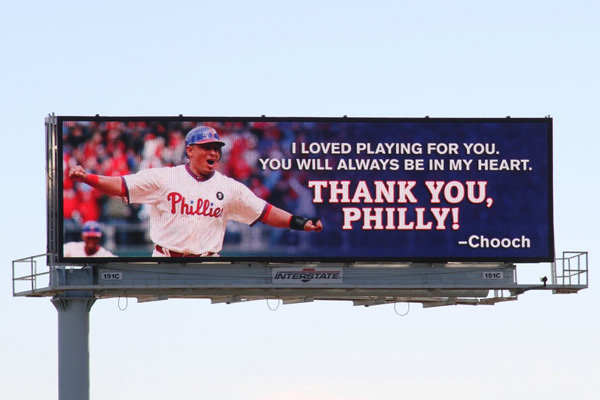 Love you all, Chooch! Gracias." 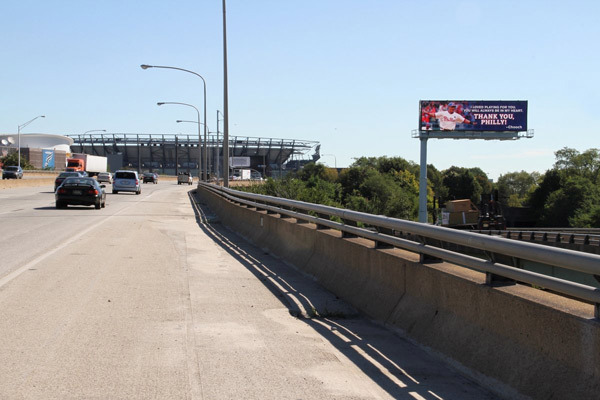 The billboard showed up on the same day the Phillies announced their 2017 schedule. They open the season on Monday, April 3 in Cincinnati. The home opener will be on Friday, April 7 at 3:05 p.m. when the Phillies take on the Washington Nationals at Citizens Bank Park. And, for those wondering, the Phillies play the Dodgers in April and September of the 2017 season.